Criminals are getting away with a handful of copper and that could cause thousands of dollars in damages. An effort to stay proactive Nebraska City Utilities is asking if you see anything that looks suspicious around a substation or power poles, please call 911. Bicycles, wagons, or four-wheelers near a substation fence. People in or around a substation with duffel bags or backpack. People in or around a substation without a hard hat. 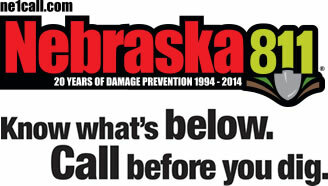 Late night or early morning activity without the presence of a marked Nebraska City Utilities vehicle. Electric power stations, utility poles, and even vacant homes and businesses are all targets for thieves, who will break in and steal cooper even from energized equipment. Copper thieves routinely target ground wires used to keep equipment safe. Electrical grounds are used to keep voltage levels constant while crews are working on equipment. Ground wires help to prevent power outages from surges and lightning. Thieves often cut holes in fencing to enter a substation. This creates a potential hazard for public, especially small children, pets, or animals who may enter substations. Nebraska City Utilities field personnel who work in substations could be potentially injured by ungrounded equipment, while doing regular inspections of substations for damages. When ground wires are removed, from poles, usually part of the wire is left hanging. High winds often blow wires around and cause damage to equipment and cause power outages. Thieves are putting their own lives at risk. Nebraska City Utilities has implemented a few measures to deter thefts. We have installed additional lighting and security cameras in and around substations. We are replacing copper wire with copper weld, a material that has no scrap value. We work closely with law enforcement to prevent theft and catch thieves. If you see anything that looks suspicious around a substation or power poles, please call 911. Nebraska City Utilities employees and contractors wear protective gear such as marked hard hats, safety clothing and glasses. Authorized vehicles display the company name or logo. Nebraska City Utilities will not hesitate to show identification if asked. Copper thefts or suspicious activities that have occurred may be reported by calling 911 as well as Nebraska City Utilities at 402-873-3353 so the area may be inspected for damage and possible repairs can be made in a timely manner.